Pefferlaw Creek Farms maple syrup comes from maple sap harvested sustainably from Sugar and Red Maple trees throughout our four sugar bushes. 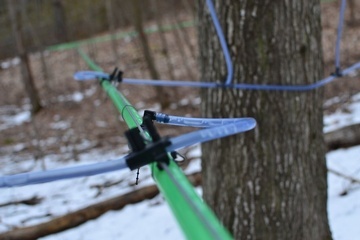 The maple sap is collected in a network of food grade pipelines. 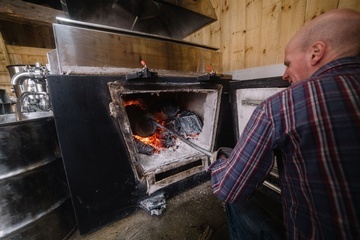 All of the sap is transferred into large storage tanks where it is trucked to our sugar shack and processed into maple syrup, boiled the old fashioned way over a wood fired evaporator. Pefferlaw Creek Farms also uses state of the art reverse osmosis equipment to increase the efficiency of our maple farm and improve final product quality and sanitation. The sooner that the sap goes from tree to evaporator, the less opportunity there is for bacterial or fungal spoilage, and our equipment ensures that this happens. After hours of boiling, the delicious golden brown finished syrup is taken off our evaporator piping hot and carefully filtered before bottling for sale or storing in large barrels for later use. With a strong commitment to final product quality, we take careful steps throughout the whole process to make sure the tastiest and highest quality product gets to your pancakes. 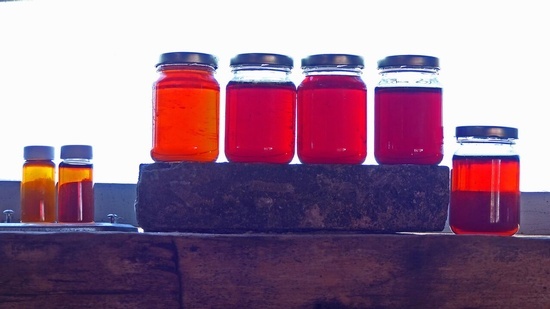 The final maple syrup product will range between 66 and 68% sugar (pure, natural maple sugar goodness!). Since the sap is coming out of the trees at about 2% sugar, there is a lot of work that needs to be done to bring it to the final sugar content. The syrup is then categorized by grade; from Golden (the very lightest) to Very Dark. In simplest terms, maple sap that is collected early in the maple syrup season will produce a Golden syrup and as the season progresses and temperature begins to increase, the sap will yield darker final syrup. Pefferlaw Creek Farms takes careful steps throughout the entire production and cleaning process to comply with organic standards. Steps include sustainable tree tapping practices to ensure that tree health is maintained long term, proper cleaning of evaporator and other equipment, among others. 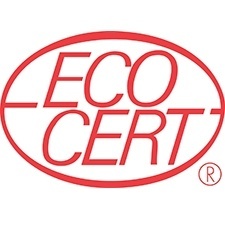 We are certified organic through Ecocert Canada and inspected yearly. 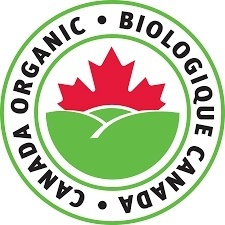 Pefferlaw Creek Farms is also registered with the Canadian Food Inspection Agency (CFIA) and our facilities are inspected annually by CFIA officials. To browse our products or place an order online please see our shop page.